Home/Auto Headliner Faqs/Even more headliner questions/How do I match the color of my headliner? The question we get more than any other is; how do I match the color of my headliner? The most accurate answer to that question is, it's almost impossible to match your existing headliner color perfectly. There are a few reasons for this answer. First, any kind of cloth material fades after some years of exposure to light which means; after a few years it's not an original color anymore. If you could get a 2 X 2 inch sample of the original headlining for your automobile - it wouldn't look like the same exact color. Not only for the reason of fade, but also because of holding a small piece of material against a much larger one, tricky to the eyes. Secondly, when the headliner material comes loose from the foam, or the foam is deterioted on the backside, the material takes on a slightly different shade of color. 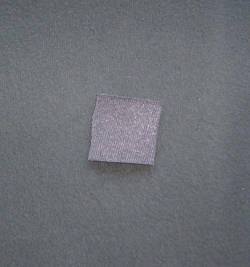 And third, wear and tear; old age makes the material look like a different shade. Headliner material is knapped nylon fabric, it loses it's "knappiness" over the years making it look a little different. Also, if you hold 2 pieces of knapped fabric side by side, the knap has to be going the same way for the material to look the same. The bottom line is, if a person tries to match their headliner perfectly, it's almost impossible, get it as close as you can, the end result will look good. If it's the same shade, whether it's a little darker or a little lighter, it will look fine once it's attached to the board, and installed in the car. Out of the 1000's of headiners we have installed at our local shop, I don't think one matched perfectly with the original material, but the customer always left satisfied. 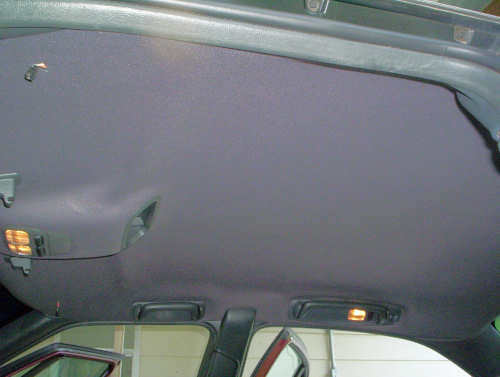 The pictures below illustrate what we mean - the top image shows a small sample of the headliner material (against the original) we used to install the headliner in this 1998 Olds 88 - it's not exactly the same color, but when installed - it looks great in the car. Why don't you let customers send in a sample of their existing old headliner so you can match the replacement color as closely as possible? You can send a sample to the address on the contact us page - quite a few people do this.